On friday I had delivered to me a record from an audio project called "Moment's Lost" from Indiegogo. 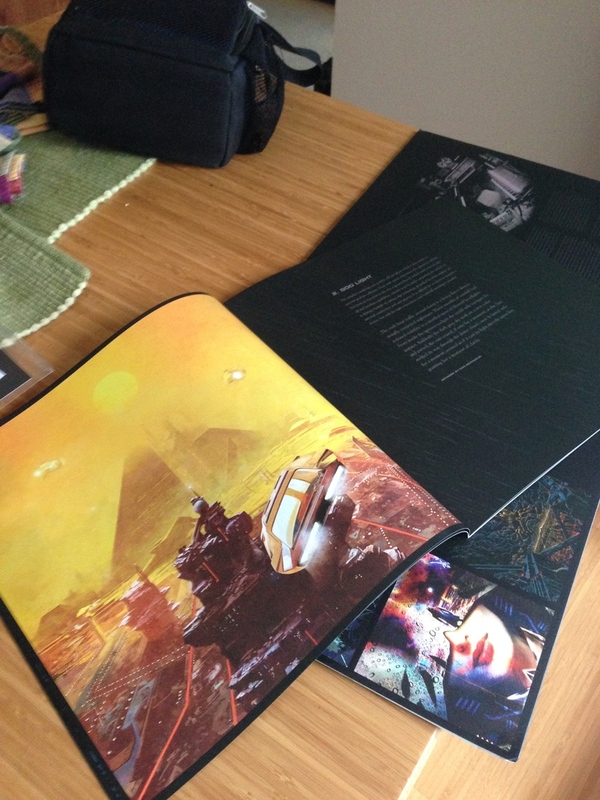 It was a music project to create an homage album to the Blade Runner Soundtrack using the same tools that Vangelis used. I received the digital copy of the album a couple of months ago, but just this past Friday the vinyl record came in the mail. The record set is very pretty and super well done. There is some beautiful artwork in in this set and I cannot wait to listen to it. Thing is though I don't own a turntable. So this weekend I ended up ordering a turntable and I am setting up some of my older audio equipment in the living room to setup a sort of listening room. But, I don't have any furniture in the living room. So we went out and bought a couple of chairs to setup for listening. I now just need to get the console purchased and setup in the next week or so for this whole thing to come together. 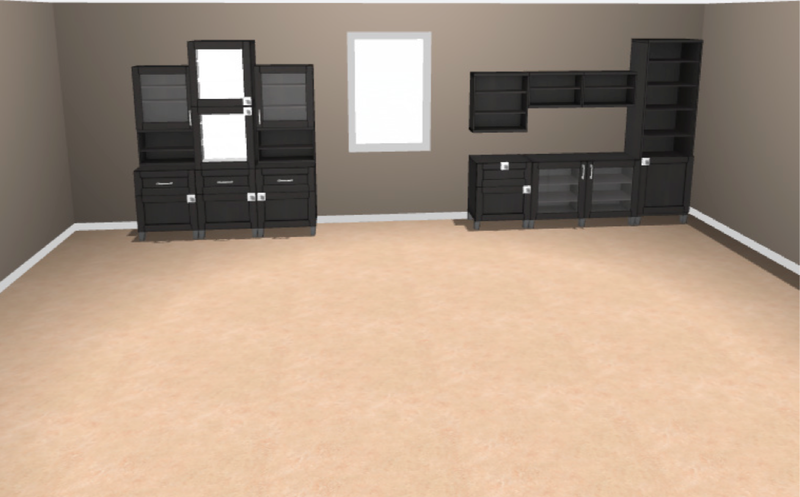 Megan spent a really good portion of this weekend designing a custom setup on Ikea's website and I have to say that I think it will really turn out nice when all said and done. My living room is much smaller than it looks and we realized quickly after getting tow chairs that not much else is going to fit in it. It is one of the reasons we have had such a frustrating time trying to find furniture for it in the past. Hopefully it will all come together here in the next couple of weeks. Goodbye 2011: The Best and Worst Year of My Life? Wow, 2011 is done. There is so much that can be said about this year. It had some of the highest highs and the lowest lows I have ever had in my life. Let’s start off with the 800 pound gorilla in the room that for those who have been following me on Facebook and Twitter know was pretty devastating. On January 31st, of 2011 I lost my boss, mentor and one of my best friends. The impact of that event changed me immeasurably and catapulted me into a world that I was not yet prepared for. I suddenly found myself in my bosses’ shoes trying to figure out how to run a department and be the boss. It was hard and there were some points where I wasn’t sure if I was going to make it. The situation at work was complicated even more by the fact that we lost the other member of our administrative team, so our department went from three to one in the matter of weeks. Emotionally I was tired and that situation only got worse when I found out that my childhood cat had died. He was fifteen so he lived a great life, but there are so many memories growing up that we had with him. This was my family’s first Christmas without him and I could see how he was certainly missed back home. He loved Christmas and was a constant pest during it, knocking over the Christmas tree, getting into the food. Funny how you miss those things when you no longer have them. I got to a point in the year where I wasn’t sure how I was going to make it. My stress levels were beyond comprehension and I was on the brink of a breakdown. Emotionally I was falling apart. I am not sure how much of my friends, family and colleagues noticed it. I put up quite a tough face, in part because I felt other people around me needed some sort of emotional rock to lean on. The year turned around on me though sometime in June. Megan and I headed up to Quebec City for our delayed honeymoon and I somehow found a bit of relief in that experience. Sometimes running away is the best way to help you prepare to confront your demons. May be I just needed to step out of the fray to prepare myself for the reality before me. I guess I could say I matured, but perhaps I found a sense of calm instead. I was still plagued by the loss of Bill and thought about those events in January on a daily basis. It is one thing to lose a grandparent who you know has their days numbered. You can prepare yourself for that, but to lose someone who is forty one to suicide, at work, when you just saw him hours ago……I was left with nothing short of rage. Disappointment. Bewilderment. Those thoughts thankfully have begun to reside over the summer. My mind is not constantly occupied by them as they once were and they now exist as an image in the back of my mind rather than a trauma in the front. After I returned from my vacation the rest of the year opened up tremendously. My wife found a new job, and I received a substantial pay raise from my promotion. If you really look at the bigger picture I am sitting in a better position than most people in this economy. I have a comfortable disposal income now and I have to say I intend to leverage it. I completed in Tough Mudder in late July. Tough Mudder is a 10 mile military obstacle course. It was hell, but it was a test of my physical and mental capabilities. It was a very high accomplishment for me. It was an opportunity for me to focus my energy and in some respect a test for me to just keep putting one foot in front of the other. A course like this is designed to break you and the true test here is your willpower. I am very proud that I was able to complete that event. Also in July I made one of the best decisions I have ever made and obtained my motorcycle license. I cannot fully explain the profound impact this had upon me this year and is one of the things that got me through the past twelve months more than anything. The motorcycle has allowed me an emotional and physical escape that I desperately needed. Because of the inherent dangers of a motorcycle, it demands your full attention, so I am unable to be bothered by the trivial issues stuck in my head. There is something incredibly calming in the raw mechanical nature of the bike as well. No radio, no gadgets….Just four carburetors, a hot engine and the white noise of wind. It is serene and an experience I opine for every moment I am not riding. As the summer changed to autumn I began to find my place at work once again. Things were slowing becoming mine. We hired a new employee for our department, which I can honestly say was a godsend. Not only was he willing to jump in feet first, but his personality fit with the organization so well you would have thought he worked with us for years and not weeks. As I approached this holiday season I was a little unsure how I would handle it all. I turned 29 on November 2nd. 29!!!!!!! Not sure how I feel about that, but the birthday was one of the best I have had. Low key and just spent with family. Exactly what I needed I think. My first wedding anniversary was in November, right before Thanksgiving and I have to say it was great. I am incredibly lucky to have the wife that I do and our compatibility constantly amazes me. Thanksgiving went off wonderfully as did Christmas. I have traditions that my wife is becoming more a part of and we are also developing some of our own. The holidays overall were a nice grounding for me and a good way to round out the year. Everything was simple and it was just a bunch of people basically hanging out together. While this year started off as one of the worst possible, it ended as one of the best I could have hoped for. It was growing period for me for sure, but it also gave me a great opportunity to re-focus my life some. I have found a new peace of sorts with myself (Thank you Yoga!!) but have also identified the types of things that make me happy. I have a new found penchant for adventure. I want to make sure that I get he most out of this life and the passing of Bill has reignited that. I saw first hand some of the problems he dealt with and corners he backed into. I am determined to not let that happen to me and I want to make sure I get to experience everything I can. I want to make sure I don’t say “No” to an opportunity as it arises and I want to make sure I get to experience all that I can. I am the type of person that needs to be challenged and I find reward in completing those challenges. My wife suggested that we both create a list of things we want to accomplish in 2012. It was a great idea and I hope to have that posted tomorrow to outline my thoughts moving forward. I hope everyone had a wonderful year. I still miss you Bill.